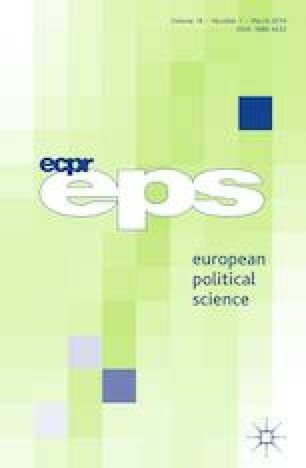 This article provides the contextual background to the symposium on Populist Discourses and Political Communication in Southern Europe. It explains the symposium’s objectives and introduces the rationale of its articles on Greece, Italy, Portugal and Spain. Within this context, the editors also highlight the specific conditions for the emergence of typical forms of Southern European populism, as well as its distinctive features, focusing on the challenges populism poses to politics and media research. The implications of the phenomenon for the future of the European project are also addressed. Susana Salgado’s research work is currently sponsored by the Portuguese Foundation for Science and Technology (IF/01451/2014/CP1239/CT0004). European Commission. 2017. Standard Eurobarometer. Available at: http://ec.europa.eu/commfrontoffice/publicopinion/index.cfm/Survey/index#p=1&instruments=STANDARD. Kioupkiolis, A., and F. Seoane Pérez. 2018. Reflexive technopopulism: Podemos and the search for a new left-wing hegemony. European Political Science. https://doi.org/10.1057/s41304-017-0140-9.